Freeze players using a GUI. Freeze players on your server using a GUI (instead of chat based). Using a GUI not only looks better, but it's more ideal for screenshares because they can't change any settings in minecraft (such as hacks or other settings), use commands, chat, or anything else until unfrozen. The GUI colors are completely customizable, along with all messages. Freeze GUI: (colors can be changed, and the left & right spaces can also be filled in with another color). Players cannot close this to change a setting, chat, use commands, etc. unless they get unfrozen. - freeze.freezeplayer - Let someone use the /freeze command to freeze someone. - freeze.unfreeze - Let someone use the /defrost command to unfreeze someone. - freeze.cannotfreeze - Let someone be immune to being frozen. title: "You have been frozen!" 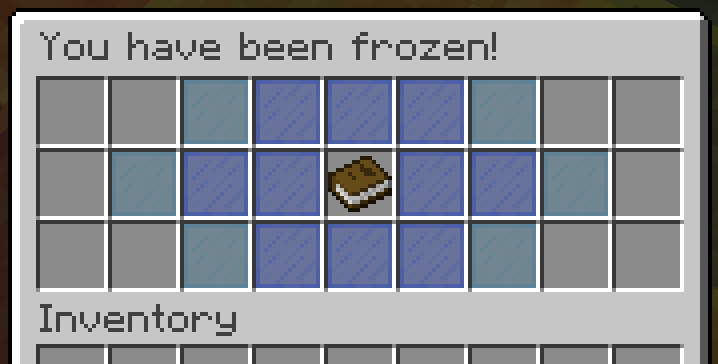 item-title: "&4&lYou have been frozen!" - "&cWhen a staff member freezes you, you"
- "&caren't able to move. This is usually"
- "&cused if you are misbehaving, causing"
- "&ctrouble or damage to the server,"
- "&cawaiting a screenshare, etc." no-permission: "&4You don't have permission!" not-online: "&4Error: &cPlayer is not online!" frozen: "&4You have been frozen by a staff member!" unfrozen: "&2You have been unfrozen by a staff member!" cannot-freeze: "&4Error: &cYou cannot freeze this player!" cannot-attack: "&cThis person is frozen right now, you cannot attack them." Stop mobs from attacking or breaking things. Periodically remove items, mobs, and lag from your server. Add trampolines to your world!